Anti-doping policy is the subject of an ongoing debate. It has played a significant role in efforts to curb doping over the past few decades. Yet among practitioners and scholars alike, very few argue decisively and with enthusiasm in its favour. 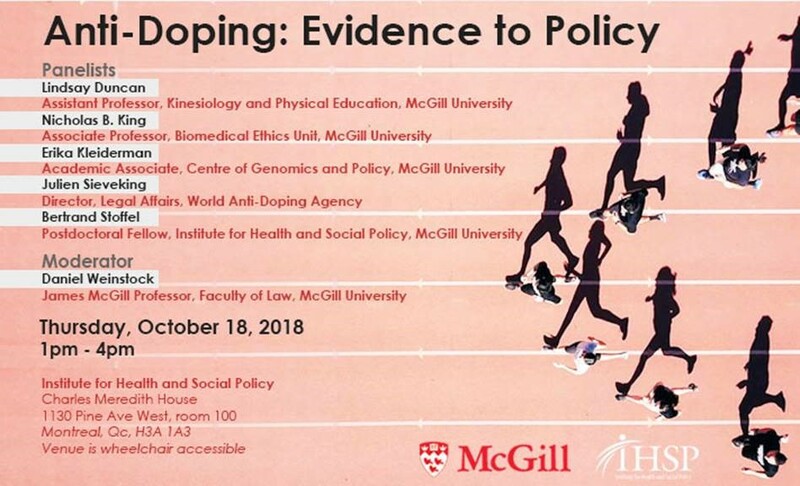 On 18 October 2018 from 1-4 pm, the Institute for Health and Social Policy will host a discussion panel on how evidence can inform anti-doping policy. The panel will bring together perspectives from a well-rounded group of researchers who will provide insight into their research on anti-doping policy. Moderated by Daniel Weinstock, the presentations will address issues of public health ethics (Nicholas B. King), education and intervention among athletes (Lindsay Duncan), anti-doping ethics and gene doping (Erika Kleidermann), as well as current legal challenges for the international anti-doping framework (Bertrand Stoffel). Furthermore, Julien Sieveking, Director, Legal Affairs at the World Anti-Doping Agency will provide a first hand account on the ongoing revision of the World Anti-Doping Code. Erika Kleiderman is a lawyer and an Academic Associate at the Centre of Genomics and Policy at McGill University. She holds a civil law degree (LL.B.) from the Université de Montréal, as well as a B.Sc. in Psychology from McGill University. She was called to the Quebec Bar in 2014. Currently, her research deals with the ethical, legal, and social implications surrounding access to data and genetic information, biobanking, and the regulation of stem cells, regenerative medicine and new reproductive technologies. Erika is engaged in the stem cell and regenerative medicine community through her involvement with the Stem Cell Network’s Trainee Communications and Training & Education Committees, as well as through her coordination role in the pan-Canadian initiative aimed at assessing the adequacy of existing regulatory frameworks and considerations for reframing theAssisted Human Reproduction Act, in light of evolving reproductive technologies. She is also the Coordinator of the Canadian International Data Sharing Initiative (Can-SHARE) and the Access Officer of the Canadian Partnership for Tomorrow Project (CPTP). Her work in the context of anti-doping has focused on the potential applications of gene editing for performance enhancement (gene doping), as well as the implications of gene therapy and enhancement in minors within a sporting context. Parents are legally recognized as the surrogate decision-makers for their children until they attain legal capacity (majority or maturity) to make autonomous decisions. As such, the best interests of the child are primary. With the advent of CRISPR-Ca9 and the potential to one day be able to select for or make desirable genetic modifications that favour athletic prowess, will parents subject their future children to such enhancement? Transhumanists argue that parents and society at large have a moral obligation to not only ensure a child’s best interests, but also provide the child with the best life possible (i.e. improve biology and quality of life). This has been refuted as going above and beyond what is expected of parents and raises concerns increasing social inequalities. Irrespective, the State has an obligation to protect the vulnerable (parens patriae). While nowhere near the actual genetic enhancement of existing children, the selection of the ‘best’ or ‘most favourable’ embryos is something that is currently possible. Could this be seen as a gateway to selecting for athletic talent? In this context, a child’s favourable genetic predispositions or athletic giftedness are no longer just a matter of chance (i.e. ‘winning the genetic lottery’) but rather a conscious decision made by one’s parents. Unlike the decision to use performance enhancing drugs, which rests on the shoulders of the athlete, the responsibility of genetic enhancement in minors is not intrinsically tied to the athlete but to those concerned with keeping his/her best interests at heart. This would thus shift the whole framework upon which sport is based (i.e. the perfection of natural talents) and require a revision of the concepts of what is considered ‘natural’ and of the ‘spirit of sport’. Lindsay Duncan is an Assistant Professor in the Department of Kinesiology and Physical Education at McGill University. Her research draws from both social and health-psychological perspectives and concerns the effectiveness of messages designed to prevent risk behaviours and encourage health behaviors in adolescents and adults. Lindsay Duncan has a keen interest in a wide variety of behaviors including physical activity, healthy eating, smoking, substance use, and sexual risk behaviors. Recently her research has focused on developing and evaluating videogame interventions focused on behavior change, education, health, well-being, and social intelligence, using the most rigorous scientific methods and metric available. In close partnership with researchers and videogame developers, she has developedfour theory- and evidence-based videogame interventions for teens:PlayForward,which aims to reduce HIV transmission behaviours;smokeSCREEN v.1 and v.2,which focus on preventing cigarette and marijuana use; andOneNightStan which aims to empower young women regarding sexual encounters to reduce HIV risk. With funding from the International Olympic Committee, Lindsay Duncan is currently developing a videogame intervention focused on preventing sport supplement abuse and doping among adolescent athletes. Research has shown that up to 60% of adolescent athletes report the use or abuse of a legal performance-enhancing substance and that most athletes who dope as adults began doing so before the age of 16 years. Thus, programs to educate young athletes and to provide them with the motivation and behavioral skills to avoid doping are critically needed. The goal of this project is to develop and evaluate a values-based doping prevention videogame intervention,True Champion, targeting the prevention of doping and supplement abuse among athletes aged 13 – 16 years. Rooted in theory the game will include rich, interactive curricular content that will provide the players with the information and motivation they need to make empowered and informed decisions to avoid doping. We will then use rigorous scientific methods to evaluate the efficacy of the game through a randomized controlled trial with 284 athletes to ensure that it is reaching its potential to provide valuable doping prevention education to young athletes. Bertrand Stoffel is a Postdoctoral Fellow jointly at the Faculty of Law and the Institute for Health and Social Policy, McGill University. His research covers two areas in particular, private law (contract law, evidence, international arbitration, and comparative law), and public health law (anti-doping policy, harm reduction). As a Postdoctoral Fellow, Bertrand Stoffel has developed a multidisciplinary research program exploring the legal and ethical dimensions of international anti-doping policy, as well as the legal tools that are best suited to protect athletes' rights and health. Bertrand Stoffel holds a Doctorate of Law from the University of Zurich, Switzerland (2017), and is also a member of the Bar of Zurich (2016). He is an editor for the Canadian Journal ofBioethics. Current anti-doping policy focuses on testing and on imposing competition bans on individual athletes who are in violation of anti-doping rules. It is each athlete’s personal duty to ensure that no prohibited substance enters his or her body. The presence of a prohibited substance in an athlete’s sample is sufficient to demonstrate an anti-doping rule violation, regardless of the athlete’s fault. By avoiding consideration of the athlete’s fault in establishing an anti-doping rule violation, anti-doping policy puts athletes under considerable pressure. This system, generally referred to as the “strict liability” principle, is a well-established feature of anti-doping policy. Justified largely by the lack of investigative power and resources of anti-doping bodies, strict liability is an efficient way to hold an athlete liable for the presence of a prohibited substance in his body that is all but always coming from an exogenous source. The strict liability principle has been criticized for two reasons. The first category of critics brings together arguments along the line that the strict liability rule imposes an unreasonable burden on athletes. Because they fear liability, athletes may see themselves forced to avoid ingesting anything other than unprocessed food, and stay clear of meat and nutritional supplements altogether because of the risk of contamination. Anti-doping rules clearly was not intended as a complete dietary regulation, but the strict liability rule appears to incentivise such behaviour by athletes. The second category of critics is concerned with the consequences of the strict liability rule for athletes who have used prohibited substances, because it seems all but impossible to learn what is permitted and what is prohibited, and to reliably avoid legal consequences by following anti-doping policy. This presentation explores those critics and reassesses the strict liability principle in anti-doping. It suggests alternative liability models to better balance athletes’ rights against the fight for clean sport.